“Ferry,” the English noun and verb, is derived from the Old Norse “ferja,” to move across a body of water. “Ferry” is related to German “fahren,” to ride, or to travel, the sense of which includes duration. It is richly cognate with the Latin “ferre,” to bear, which is legible in such common English words as “transfer,” “infer,” and “refer.” The two volumes that bookend poet David Ferry’s work to date are On the Way to the Island (Wesleyan, 1960), and his selected poems, out this month from Waywiser Press, On This Side of the River (2012). His name is an answer to a reasonable question raised by each title: “How did you get to the island?” And: “How did you come to be on this side of the river?” The pun reverberates through sixty years of one particular man’s feeling, and thinking, and writing, and through 5000 years of literary culture. When his second book of poems, Strangers, came out in 1983, after a 23-year silence, and David Ferry stood on the shore of its accomplishment, the doyen of Akkadian studies at Harvard, Bill Moran, gave him an assignment: translate the epic of Gilgamesh. 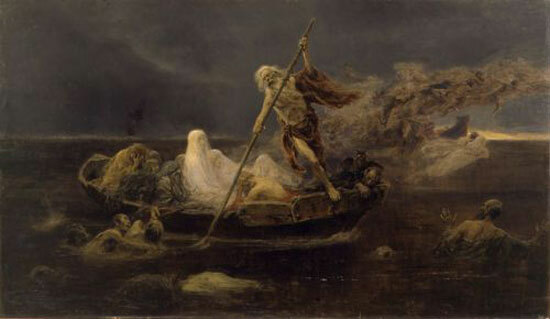 When the hero of the poem, a stranger, approaches Urshànabi, the ferryman without whose guidance he could never cross the waters of death, Gilgamesh must retell the ferryman the story of the grief that is written on his face and body. The story serves to establish the hero’s identity, and his need, but it is also necessary because the retelling of stories is one of the things an epic must do — one of the things a hero does. So it came to be that David Ferry, who cannot read cuneiform, an English professor and a stranger in the land of Ancient Near East Studies, gave a voice, his voice, to the ferryman Urshànabi. Bill Moran and David Ferry became ever-faster friends as Ferry worked on his assignment. Like Urshànabi, whose fate it was to move back and forth across a body of water, and who became, at a crucial moment, Gilgamesh’s life-coach, Moran helped his stranger-friend to reach Utnapishtim, from whom he might seek the secret of immortality and balm for grief. And like heroic Gilgamesh, Ferry succeeded, coming across with a beautiful rendering of the Akkadian epic, one strong enough to establish his claim to the name of translator, bearer of works across waters, bearer of works across time. Misunderstandings of the sacred text. The persistence of such stories derives in part from paradox: to be in the “reading room”, looking for answers, looking for balm, is a universal, if not permanent, condition. But what do we, who are bewildered, really know about bewilderment? He’s old, but being a god, old age is young. It is hard for me not to see in this a coincidental — or fated — self-portrait. Ferry’s “glaring eyes” gaze at us from the back of his Bewilderment, though he has eschewed the “filthy mantle” required for the role of Charon and is dapperly turned out in a driving cap and an architect’s eyeglasses. Two pages later in the book, “Untitled Dream Poem” depicts in a word painting “plants that blossom in the dark” and cannot quite be discerned, such that they appear to the speaker as “the red rear lights of cars rushing away / To get to the shore to try to get on the boat.” In this image Ferry has transferred all our summer-weekend driving anxiety to get “there,” and to get “back,” and to be “there,” and to be “back,” reframed it as a portent of our unavoidable undoing. We have a right to be skeptical of David Ferry when he says he has been “dislanguaged.” For 60 years he’s been making a study of our common bewilderment, finding words and lines that capture, captured us. (How often we are estranged, or parted, from what we want or what we would say!) Nonetheless he is an authority on “dislanguagement,” an expert on being stranded who has worked both sides of the river. At 88 our ferryman is old, but—thank goodness—old age is young. Recent poems by Daniel Bosch can be read at B O D Y and The Istanbul Review. “In Memory of Johnny Cash” is forthcoming at Plume. With co-interviewer George Kalogeris, he is at work on “The Art of Poetry” interview with David Ferry for The Paris Review. He lives in Chicago. On April 6, 1327, in Avignon, in the Kingdom of Arles, an Italian scholar named Petrarch saw and fell for a young girl named Laura.